It became an official project called Green Hand two years later when the Green Party moved into city hall under socialist Mayor Bertrand Delanoe. Paris is not usually known as a green city, but there are more and more small garden plots are flourishing up in the middle of the city. People who live in the neighborhood and like to garden take care of the plots and open them to passers by. Since then the city has given interested hobby gardeners access to plots complete with fences and water sources. The gardeners founded an association and finance their projects through membership fees. 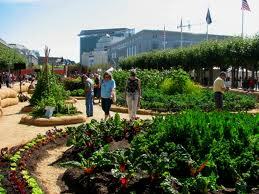 There are about 60 community gardens in Paris. Gilles Roux, 60, one of the founders of the community garden movement in Paris, stomps his feet, waves his arms in the air and darts between the rows of his beloved vegetable garden while complaining about the birds. “The pigeons are eating all the seeds we sow,” gripes Roux. 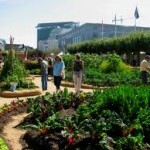 He spends several days at the garden, which is like many urban gardens that have become popular in other urban settings. Dressed in a blue checkered shirt and floppy hat, Gilles goes to the garden proudly and points out what he and other gardeners have achieved. Cornflower,Marguerites and roses bloom in some of the 50 circular beds, others have herbs and vegetables gardens such as tomatoes. According to the association’s charter, members are required to open their gardens at least twice a week to their visitors. In addition there are about a dozen of private community gardens, which are considered green islands in a city that has few parks compared with other major capitals.